For the past few summers, floppy hats have been everywhere with fun and witty phrases on them. Not only do I have heart eyes for witty phrases, but my pasty complexion and I love giant sun coverings. ‘The bigger, the better’ is our motto. The best option is always a tarp, but those can be tricky to travel with. b) had to do with knitting. Sunbathing knitters are apparently a narrow market, so I had to make my own! funny… but not the family friendly vibe I was going for. Initially, I wanted to write ‘when I sits, I knits’ on my hat- but decided that was a bit long and ultimately went with ‘probably knitting’ (which, in hindsight, actually consists of more letters… but whatever). I started off using a hot glue gun and a string of sequins, but it was really hard to do this legibly. I got half way done and then very dramatically ripped all the sequins off. Good thing hot glue peels off easily, right? So for those of you keeping score, the longest step in my hat-making process was using a hair dryer to slightly warm up 8 letters written in hot glue juuuuuust enough to peel off of the hat, but not so much that it turned back into liquid glue. It was a labor of hate an exercise in patience. At this point it is 10 AM, we’re leaving for our cruise at 11 AM, and (naturally) I am the picture of grace and composure. I thought about trying hot glue again with a thin ribbon instead of sequins, but frankly I didn’t have time to go through the Hot Glue Debacle of 2019 again. I turned to Old Trusty (my Cricut machine), cut my phrase of choice out of the iron-on vinyl, and then ironed it on to the brim in the nick of time. Noah: I loaded the car, buckled the kids in, have the dogs all ready for the kennel, and pre-ordered us a latte for the road. Me: JUST ABOUT DONE IRONING “PROBABLY KNITTING” ON THIS HAT, BABE! Noah McCarty: the man behind the blog, and also the real MVP. I truly don’t deserve him. I used iron-on vinyl with my Cricut. You could probably also use regular adhesive vinyl unless you’re a full-body contact hat wearer. My hats lead a pretty sedentary lifestyle, just like their mama. I think the hot glue and ribbon/rope idea could be done well- but just not quickly enough for my timeline. 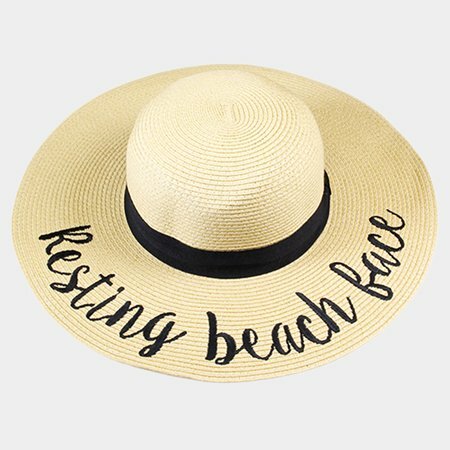 If you don’t have a Cricut machine, you could still make a cute hat with pre-made iron-on letters or durable and very sticky letter stickers. If you’re using a Cricut to cut out the letters like I did, I estimated the curvature of the words by ‘drawing’ a flat version of the hat in the maker software. I measured the diameter of the brim (big circle) and head part (small circle) and then recreated those using circles in the software. Then I just aligned the words in between the two circles to get the size and shape right. For sturdy stickers, just stick them on! For the hot glue/ribbon option, hindsight tells me it would be helpful to lightly draw out your mantra before you start gluing. Apply glue in small increments (~1” at a time), lay ribbon, and then move on to next 1” section. It is a good idea to lay out the ribbon for the next section before you glue just to ensure you know how it will lay, ensure it isn’t twisted, etc. And then pack, transport 9 hours via car, carry onto cruise ship, and proceed to wear for 1 hour… while crocheting. Want to know when the little onion has a new layer?